The Batch of 2012 has seen a remarkable response from the Industry in terms of Final Placements and yet again made SIBM Bengaluru a force to reckon with amidst the B-school landscape in India. The placements season which started in November 2011, saw most of the last year recruiters who share a strong corporate relations and are impressed by the performance of our ever strengthening alumni, re-visit our campus to hire the students. Defying all the economic uncertainty and the market conditions, 48% recruiters visited campus for the first time which includes prominent brands like Tata Motors, Cisco, JP Morgan, KPMG, Caterpillar, Radio Mirchi and Oracle. Companies gave offers across a plethora of functions like Corporate Finance, Equity Research, Financial Services, B2B Sales, Sales & Business Development, HR Generalist and Consultancy. Recruiters like Deloitte, Wipro, Infosys, Zinnov Management Consultancy, Entercoms & JDA Software offered consultancy roles in different domains like Technical, Supply Chain, Quality Excellence, Strategy and Management. Sales, Key Accounts Management, Marketing & Business Development roles were offered by some of the majors like Tata Motors, MTR Foods, NIIT, FedEx. 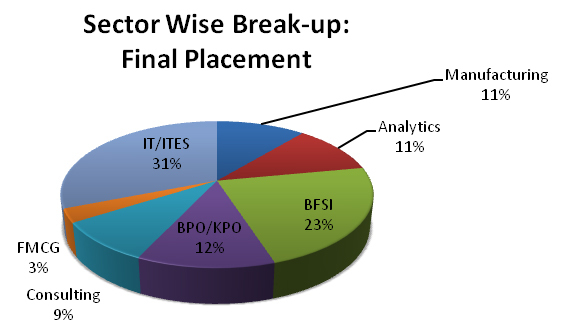 Companies like HSBC Analytics, HP and Mu Sigma Business Solutions Offered roles of Business Intelligence and Analytics across domains. Financial Roles like Corporate Finance, Equity Research, Financial Analyst, Financial Operations were offered by companies like JP Morgan, Dell, KPMG, Aranca and CRISIL Global Research & Analytics.